As I have mentioned before early math is not my strong suit so I am learning too. I had seen variations of Link ‘N Learn Links being used. 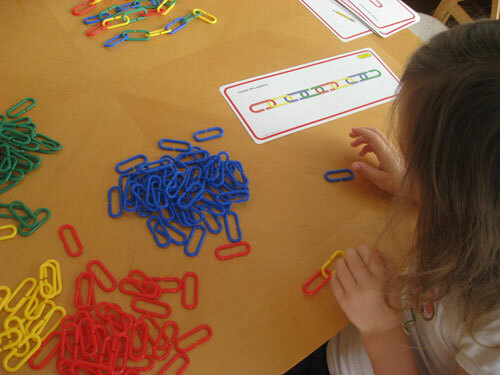 I didn’t ‘pin’ them so I am afraid I can’t show you examples but I have seen paper clips being used instead of links and homemade activity cards. I took the easy option (I am scaffolding my learning) and used Link ‘N Learn Links and Link ‘N Learn Activity Cards. The wonderful resource guide took things step by step for me. If I was teaching fractions I would know exactly where to start; (no problem for a grade 6 teacher) but for early patterning, I am enjoying using resources. The first time I got this resource out I remembered to let Daisy play. I have made the mistake of trying to do a structured activity without letting her play and explore the materials first. It never works. I firmly believe in learning through play and if an activity is no longer fun for my flowers, they will not be doing it. 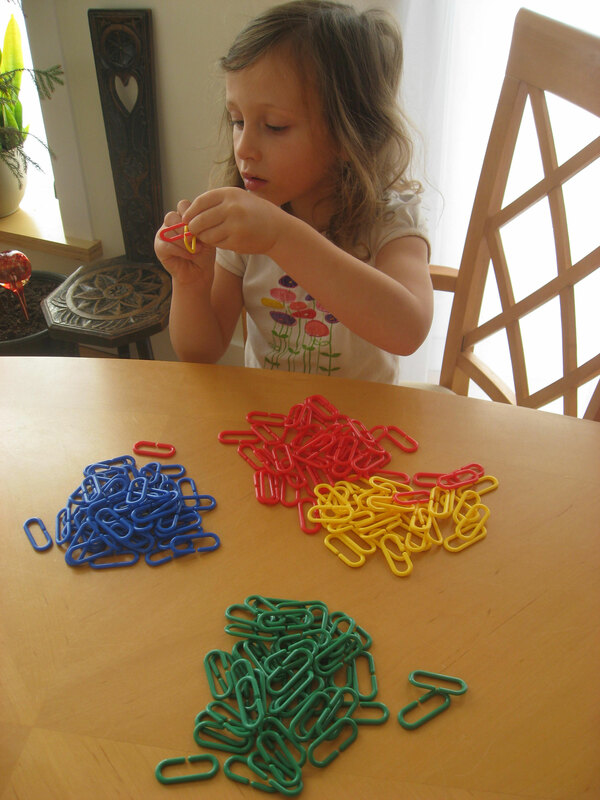 She had made bracelets and necklaces for herself and her stuffies before sitting down to do this activity. 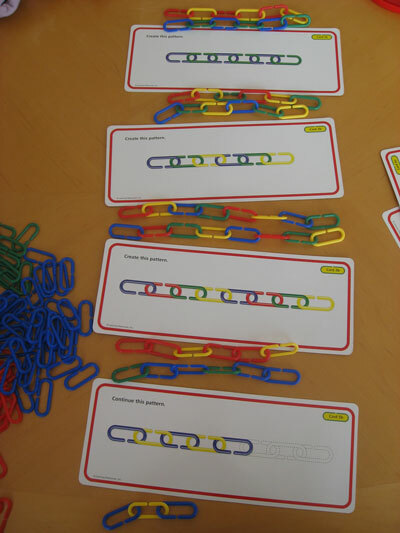 The following day we started sorting the links by colour. We looked at the activity cards and started at the beginning. They are all double sided and clearly labelled, starting with 1a then 1b and moving on to 2a etc. We discussed the pattern saying aloud the colours; “red, yellow, blue, green, red, yellow, blue, green,” and Daisy joined in. Daisy played, making patterns for 20 minutes. As you can see from the picture below she was just getting to the continuing the pattern point when interest was lost. Her colour matching and sequencing skills are strong and I think we are ready to move onto continuing patterns. What you can’t really see is that she insisted on matching the break in the links also. The activity cards show if the link break is at the top or bottom. Daisy simply HAD to match the break in her pattern, with the card (a perfectionist in the making – yikes!). How have you used links?